Logically, I could not bring a piano into the studio. This is my favourite instrument currently and I feel most confident on it. A violin could go too wrong too easily and I have not played in front of anyone for years. Therefore, I wanted to record the piano and play guitar over the top. After the performance, I found that just bringing in a keyboard would have been easier and I would have been more confident, as I was shaking too much to play the guitar properly. I also found that I did not know the same songs on guitar as I did piano and therefore was a slight rush to learn them on guitar. I improvised very quickly as I panicked during the performance. I had a look at what some of the easiest pop songs are to play on the piano and the violin. Having a look at these, and having a look at the time I had with the piano [at home], I felt like I did not have sufficient enough time to learn and play either single, or multiple songs. For this reason, I looked at the six songs that I am already comfortable playing on the piano, one of which I can play on violin (Scarborough Fair), and another of which I can play on guitar. I wanted to play A Thousand Years, however in order to play it like this, it would take a long time to learn and practice. I also felt more comfortable trying to learn something on the guitar within the time span than on the violin. I then mixed these together on Adobe Audition in order to gain a length of track to play along to. I wasn’t sure if I would be able to create characters out of the music, such as Silvie Fleury does, because I was only manipulation songs that I already know, rather than making my own. I decided on the room in the studios that reminded me most of my bedrooms, wherever I have lived (see top two photos). I felt like this would have made me feel more comfortable and confident within the performance. I was also inspired by the use of space by Matthew Barney and I wanted to use every part of the space. If I had more time, I would have completely kitted out the room to become more like my bedroom. I made the space more like my home by having my own blankets and cushions, fairy lights and my day-to-day things all over the floor in the corner. I decided not to have a microphone for during the performance as this wasn’t part of the ‘homely’ feel I was going for. I did, however, decide to go with a small speaker I had in order to get the volume needed for the piano piece. After the performance, it was clear that this needed to be placed behind the camera as it has not come out very loud, however this is also edited before publishing the final video. I was really nervous while we were going around and watching other people doing their performances and showing their videos – I felt like mine was then too long and too different (in a bad way). These ideas that were coming into my head were not helping with confidence levels to start the performance. I honestly then felt quite sick with nervousness. I had thought that everyone would naturally migrate to the area that I was in, and I would start the performance from there. This was not everyone else’s plans. I ended up playing one of my favourite riffs in order to calm my nerves and get everyone in the room. They were given instructions beforehand to enter while playing that riff and to sit around the room and to make themselves comfortable. I took the inspiration of allowing people to walk in from Vanessa Beecroft. At ten o’clock this morning, we were gathered as a studio group and instructed to set up an exhibition by 12:30 with all of the portraits that we previously hung around the department. The space that we used initially had to be cleared as it was full of tables, chairs and work from other studio groups. The floor was swept and we were informed of our brief: set up an exhibition of our portraits using exhibition inspiration from artists such as Wolfgang Tillmans. We were not to put all the self-portraits along the wall in the same manner and at the same height. A press release also needed to be made. We lined up all of the portraits and found that common theme was the use of backgrounds. There was four categories of background: black, white, blue and ‘other’ colours. This made the planning of the exhibition easier: the black portraits were quickly hung on the windows and the white portraits on the pillars in the room, as though these opposing colours were looking at each other. A suggestion of hanging some of the portraits from the ceiling was soon raised by myself. The hangings from the ceiling would make the exhibition more interactive as you would have to walk between them and look up in order to fully appreciate the piece. Everyone helped to put the four portraits with the blue background up at varying heights using sting. The last three pieces, with the coloured backgrounds (excluding blue) were then placed at equal intervals on the floor. Once again, visitors to the exhibition would have to walk around, and look around, in order to view these portraits. Lights were added in this process along the floor. It was thought that we should black out the windows, however many in the group were confused at this prospect – not only would we of had to have used bin bags to black out the windows which would have looked tacky, the room was also chosen for its natural light. As a group, we therefore decided to stick with natural light in the room. As it got darker, however, the two small spotlights on the floor began to seep into the space, illuminating the floor. When it was brighter outside, however, the spotlights were not as effective and almost pointless. I did find that they did reflect on the shiny surface of the floor and this created a river of work when stood at the right angle. A suggestion was also made of using the TV screen that was next door in order to play the videos that we made of us talking about our videos. I piped up and said that I didn’t really want to see my own face replicated three times in one room, and for everyone else to see me four times! I proposed that we used the voices instead of a video. A voice recording was then made of each person talking about their self-portraits from the Facebook videos. This was then placed under one of the pieces on the floor, making it discrete, loud and central to the room. Other places, the phone would have been seen, or it would have been in the corner of a room. A press release was also crucial to the exhibition. 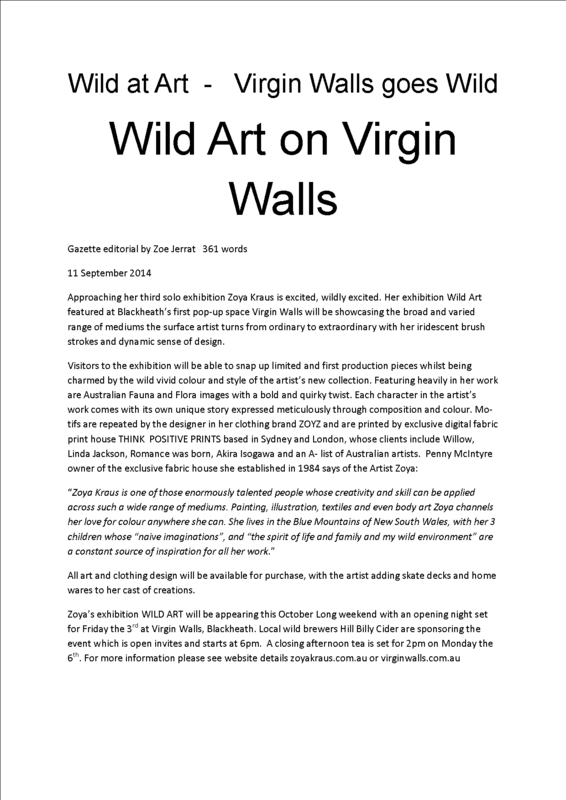 As this was the first press release that I have written, I enlisted some help from the Athen B Gallery, Wild Art on Virgin Walls, Tom Ford and The Practical Art World. These were all used collectively in order to write a complete and concise press release containing the details of the gallery, the artists, exhibition dates, and information about the exhibition. The final Press Release is available online. We came to a group decision on the name of the exhibition as ‘Don’t Look at Me’. I enjoyed curating the exhibition with the other students, especially being able to bounce ideas off of one another about different elements, and the quick pace of getting ready. I found the final outcome of the interactiveness of the exhibition very powerful too, as it invited you to travel down the portraits and look up and down, in order to view all of them. I did, however, find that my portrait was a little swamped with light from the window behind, and thus could not take an effective photograph of it displayed. It did work effectively hung, looking down at people, as sometimes I catch myself doing this – another secret revealed. As an introduction into second year, over the past couple of weeks we were given a title, and told to produce a video, or a short film, from this. The title that we got given was ‘The Giant of Illinois’, which turned out to be an American folk song. This was purposefully chosen for us as no one would have recognised it, as our Tutor didn’t believe anyone listened to that genre (she was correct). The only other instructions we were given was to add the title at the beginning and ‘the end’ at the end. We also decided to stick with the song ‘The Giant of Illinois’ by Andrew Bird, as our backing track, as we believed the video clips we were taking and the soft melody interacted with each other very well. It wasn’t until just before editing, did I look at the lyrics. It was then a juxtaposition between calming, natural scenes, and the lyrics about pain, and falling into a woman’s arms. Individually, we went off and filmed different animals ‘doing their day-to-day business’. This included squirrels bouncing across the grass, ducks, geese and swans in the lake, and even rats cleaning themselves under the shelter of a fallen tree. Above: Short clips that we filmed as a group around Reading, focusing on animals and birds. We came together as a group in order to edit the video clips together into the full film. We were initially concerned that we had too many lips to choose from, but this concern quickly diminished when we began to crop clips and fade them together. The song also caused us concern as it is a total of almost 5 minutes long. We tried to crop the song in several places, but found that this caused missed beats and stuttered lyrics, and therefore deciding that we should instead use the whole song. We also decided to use the song instead of any other backing tracks or sounds as we felt this was the best representation, or the best juxtaposition with the video clips. Throughout the editing stage, each person played a part and agreed on several elements including transitions, which clips would go next, and where they should be cut. Many of the clips naturally fitted in with the song, especially the percussion and beat. This included flying, landing and moving the camera in time to the rise and fall of the song. While filming, this was unintentional. We tried all of the video transitions on Adobe Premiere Pro CC 2017. Additive dissolve was a very garish effect, cross dissolve sometimes showed the video stop into an image, dip to black and dip to white were not effects that suited the video. Then morph cut added strange test for milliseconds into the video and non-additive dissolve gave an opposite garishness to the additive dissolve transition. The most appropriate dissolve transition we found was film dissolve, giving us the chance to transfer between the different animals without the difficulty that each of the other effects gave us. Working with clips that were both portrait and landscape did get a little bit annoying, and all of these were different qualities. This is a problem that we managed to overcome, however I feel that if they were all orientated the same way, it would have a more professional finish. I feel as though the final video could have been more polished, starting with the orientation and the quality of the clips. Unfortunately, we all had different cameras on our phones, which affected the overall quality that we could safely render our video at. I also feel that some of the transitions were hastily placed, and could have been polished up a bit more. Overall, I enjoyed working with this group on our film. This is a short video explaining why I painted my portrait and the background story behind the painting. For more information on the self-portrait project, please visit Self-Portrait and Don’t Look At Me Exhibition. Immediately in second year and a small project has begun. We have been asked to draw, paint, sketch and produce a photorealistic self portrait on a small round piece of canvas board. This self portrait has to show something that no one knows about us in the art department, and took a video with a small explanation of what this was. After looking through many photos from since I was a child and my fears and thoughts no one knew, I decided upon my fear of failure. We then left these at eye level around the second year studio. Something many people don’t know about me is that I am afraid of failure and afraid of dropping below expectations, especially my own. This happened to me in my GCSE’s – my school, I believe my family and friends, and I, expected majority A and A* grades. I ended up getting three A*’s, two A’s and the rest B’s after getting many papers remarked. I was incredibly disappointed with my overall grades. From here, I knew I could never fail myself like that again, so much so, it has become a large fear of mine, and hence why I push myself again and again and again. Since my GCSE’s, and especially my Art GCSE, I have not been disappointed by the rewards and results, even though it will always be something very much at the forefront of my mind. I chose to paint this piece as I have never painted a portrait before. I also feel more comfortable using pencil so this was very much stepping outside of my comfort zone. I was shocked and surprised at how difficult it was to create the correct skin tones and expression using a paint brush rather than a pencil. Although I am proud of the final painting, there is still a small part of me that believes I have failed painting my own portrait. Above: An assortment of photographs of me showing different moods, facial expressions and compositions in the photographs. These helped me to paint my self portrait. Above: testers on whether I was comfortable painting or drawing my portrait. I decided to paint it as I had never painted a realistic portrait before and I wanted to set myself the challenge. I was inspired by the hyperrealistic paintings of Joongwon Charles Jeong and the perfection of the imperfections. Above: comparing my face half way through the painting process and the palette I ended up with. I was shocked about how many different tones and shades that had to be used in order to recreate the photograph as a painting. Above: final painting displayed in the corridor of the second year space. I decided to use two pieces of wood to display the piece on the wall. Although this makes the painting stick out from the wall, it ensures that no nails, string or bluetac can be seen, keeping the mechanism discrete. I also put it in a part of the corridor that not many people go down as although I am proud of the piece, I still have the feeling that I have failed painting my own portrait. The corridor started to get used as a storage space, and this made my piece look like it was just hung up to show it, just as I would have done in school. It transformed the space into something that looked very unprofessional and dirty. The piece was then moved to form an exhibition. The topic for the summer project between Years 1 and 2 is ‘Be Influenced’. Dayanita Singh, Tania Bruguera, Caroline Achintre, Wolfgang Tillmans, Pipilotti Rist, Samson Kambalu, Isa Genzken, R. H. Quaytman, Arturo Herrera, Ming Wong. These artists were chosen for us on the basis that their works reflect, respond to, expresses or illustrate the contemporary world. They also invent and create material processes to shed a new or different light on a chosen subject matter. ‘The aim of the project is to reflect upon the important role influence plays in the making of artwork.’ By looking closely at one of the artists material processes, e have been asked to use elements of their visual language to create a new work, considering; the processes of how the artist begins their work, how they gather their source material, how they manipulate this and the different processes used to develop the works. We are able to develop our work from the influence, also considering how the context we live in informs and gives a different perspective to the ideas taken from the chosen artist. One idea given to us is to experiment with different mediums in order to translate the work of the artist, another is to keep a notebook to jot down ideas and sketches. Your chosen influence acts more as a guide pointing you in a direction, they are not the end point for your work. Make work over the summer that imaginatively responds to the question of what makes an influence a creative input into your work.